When Displaying Miniatures are you a traditionalist or a free spirit? 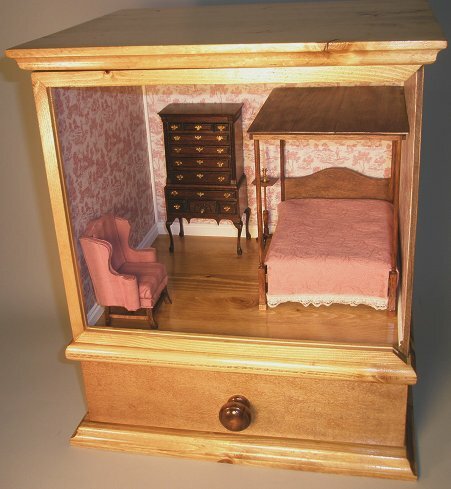 Traditionally, dollhouse furniture is built for… well, displaying in dollhouses. 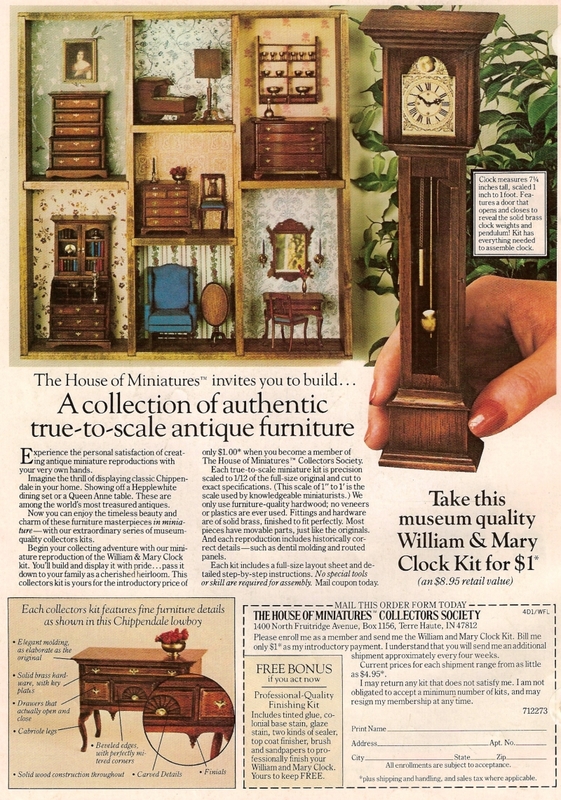 But The House of Miniatures™ (THoM) has never been traditional. And they never sold dollhouses. From their early days, THoM offered roomboxes and dioramas for displaying miniatures. At one point they sold shelves and anniversary clock like displays in their catalog. They were always about the kits, not really about dollhouses, aiming for an adult clientele rather than children. Even the accessories that THoM offered were aimed at decorating purpose-made rooms. Toile wallpaper, hand-stitched rugs, custom fabric, and curtains. I have a couple of their roomboxes and they are definitely high end. Although I’ve never found an example of the THoM display shelf, I’ve used various shadowboxes for displaying miniatures, inspired by their ads and catalogs. When mounted on a wall, a box like the one at left would be quite a conversation piece. One of the shadowboxes that I have is shaped like a little, Victorian house. It is more of a 1:24 scale, though, and doesn’t really fit my THoM kits, more’s the pity. At one point I worked with a company that built and sold their own design of roomboxes with a drawer in the base. I built and decorated samples of their boxes, acting as a tester of their kits, photographer of their product, and developer for their web site. The first design they had me build is at the left. 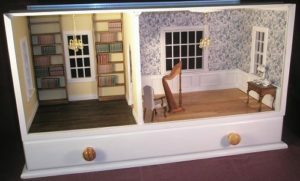 I loved the concept, but made two suggestions to improve the products: first, the single room unit was too narrow, while second, the drawer was almost deep enough to store most miniatures. By making the drawer a little deeper I could store minis in there and change the displays seasonally from what was stored there. 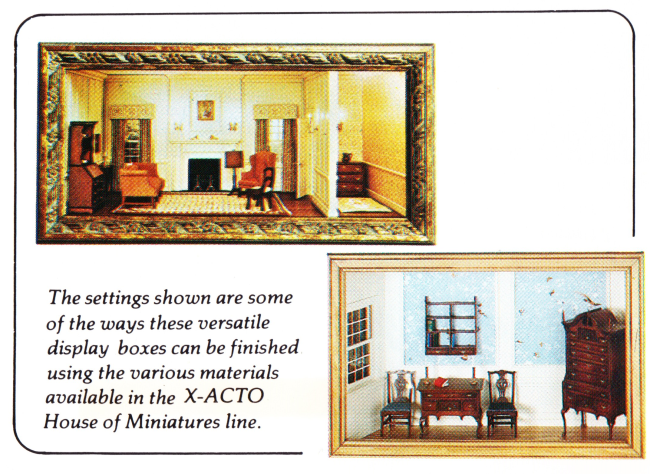 The two-room box, shown at right, was much different, but still a great design. Made of MDF, it came with window holes cut to size as ordered. I had a bunch of windows on hand, so I had them cut the openings to fit and built it as a library and a dining room. It turned out beautifully. I can change out the furniture and it becomes a library and music room at my whim. For this one I put clapboard siding on three sides, trimmed out the windows and painted everything except the knobs on the drawer. Unfortunately, the designer and the builder are no longer working together on this project. I’ve been thinking about building these for them, but I lack a couple of the tools. Would it be worth it to spend the money on the tools in order to put these back into production? 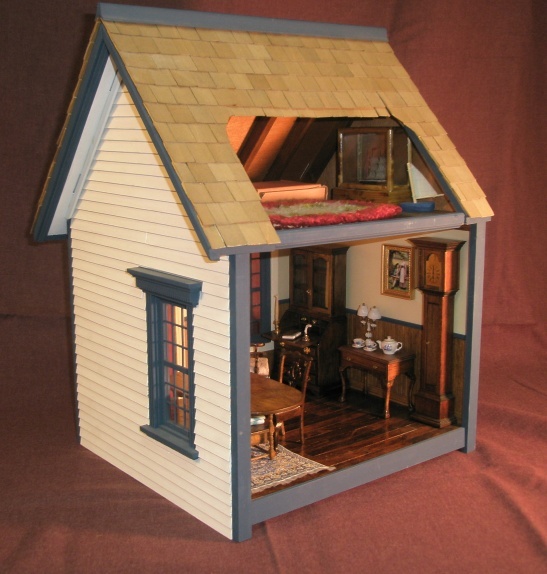 Of course, you could actually use THoM dollhouse furniture in dollhouses. I hope to build a Saltbox Colonial house, for which this little Greenleaf cottage (left) would become the ell. This is the Primrose by Greenleaf. It comes as a very cheap kit, but this one is greatly enhanced. Never mind that (perhaps I’ll write an article to review the kit), the point is that building a whole house gives you a chance to use a kit or two, or better yet, do an entire house with The House of Miniatures™ kits! What have you done to display your THoM kit builds? I’m always curious to know how other people are displaying miniatures!